Finding a job after long-term unemployment isn’t easy. Whether you took time off to raise a child, continue your education, or anything else, there are some employers who are going to have some questions about this. So I’m going to share some tips that will help you get a job after long-term unemployment, even if it’s been years since you’ve worked. If you want to get hired quickly, you’ll need a plan for all three of these areas, so let’s go step-by-step through it and I’ll explain what to do to find a new job. This is the first place you want to address your gap in employment and reasons for long-term unemployment. You want to explain what happened, including why you left your last job. Next, you want to discuss what you’ve done to stay relevant and keep your skills sharp. If you haven’t done anything, start now. Find an online course, start an independent project, or try to find a freelance client or do some consulting. It’s really going to help you get hired if you can show employers you’ve kept your skills fresh! Then, the final thing you want to do on your cover letter is show them that you’re fully available to work now. You need to make it very clear that if there was a reason that you were unemployed for a few months or years, that the reason is resolved. Otherwise, they’re going to be worried that you won’t be able to work the hours they want. Let’s say you’ve been unemployed for two years while caring for an elderly family member. Now you’re looking for a job, so you need to explain what changed. Maybe a sibling is helping care for them now. Maybe they’re in an assisted living facility, etc. Whatever the case, you want to explain why you’re able to return to work now, and show them it won’t be an ongoing issue. Next up is your resume. The cover letter should help you explain any gaps in employment on your resume employment history, but there are some changes you can make to your resume too. You can consider using only years, instead of years and months. That can make some gaps appear slightly shorter, but it might also cause employers to ask more questions about your prior dates of employment. There’s some benefit, but also some risk. But it’s worth trying and it’s something I’ve done myself in the past! (I’ve had a few gaps in employment and periods of unemployment. Not for years at a time, but for a few months at a time). Also, you can put anything you’ve done to stay fresh/current on your resume, even if you weren’t paid to do the work. This can include volunteering, freelancing, pro bono work, taking courses, etc. Show them you’ve been active in maintaining your skill-set. The longer it’s been since you’ve worked or used your skills, the more employers will worry that you’ve “lost” your abilities/knowledge. Is this fair? Not really. You never forget a lot of what you know, but that’s how employers view it. Next, you’ll need to be ready to face questions about your long-term unemployment in the interview. Be ready to clearly explain why you left your last job, and what caused the period of long-time unemployment since then. Then, be ready to explain how and why you’re now available to work. You want to put their mind at ease that you won’t need to resign for the same reasons you had this gap in the first place (whether it’s a health issue, family issue, or anything else). Calmly answer their questions, and try to put their mind at ease quickly and then redirect the conversation back to the responsibilities of the job. Obviously, you’d replace “HR Manager” with whatever the job title is that you’re interviewing for. But this is how to redirect the conversation back to what matters most – the job itself. The point of the interview is to show them you have the skills and experience to come in and QUICKLY get up to speed and succeed in their role. So that’s what to focus on. To get more interviews, make sure to utilize your network. Networking is often the fastest way to find a job, and always one of the most effective. Getting your foot in the door with employers, or getting them to take a chance on you and interview you, is one of the hardest tasks if you have an unusual career path or a resume with some gaps. And when somebody who is trusted by an employer introduces you directly or recommends you for a position, the employer immediately trusts you a lot more. While this doesn’t guarantee they’ll hire you, it definitely boosts the chance you’ll get interviewed. So tell everyone you’re job searching. Connect with people personally and ask if they have any ideas or leads you should pursue. Apply for a Lot of Jobs! It’s more difficult to find a job after long-term unemployment; but it’s very possible. However, you need to apply for a lot of jobs. Try a combination of methods, including telling everyone in your network that you’re job searching, applying directly to employers via their website, and searching on one or two job platforms (I like LinkedIn’s job search feature the most). You’re probably going to need to interview for at least a few jobs to find an employer who thinks you’re the right fit. And we all know you need to apply for a lot of jobs just to get one interview usually. So expect to have to put in the time and effort to get a job after being unemployed for a long stretch of time. The good news is you only have to do this once! Use your cover letter to explain what caused the stretch of long-term unemployment, and how your situation has changed to allow you to work again. Be ready to explain those same ideas in your job interview. Do everything possible to keep your skills current during the period of unemployment, including taking a few courses, volunteering, doing freelance work or consulting. If you haven’t done any of this, start now. Put any and all items from step #3 on your resume, to avoid having a big gap in employment. Leverage your network first in your job search; you’ll get more interviews when somebody that knows an employer recommends you. Apply for a high volume of positions using multiple methods. You’re at a disadvantage when trying to get a job after a long-term unemployment gap, so you need to make up for it with effort/volume. Be ready to show employers how you’ll contribute to their goals immediately. If you want to get a job offer after a long period of unemployment, you need to show them your skills are current and you’re ready to learn their job and immediately start helping. 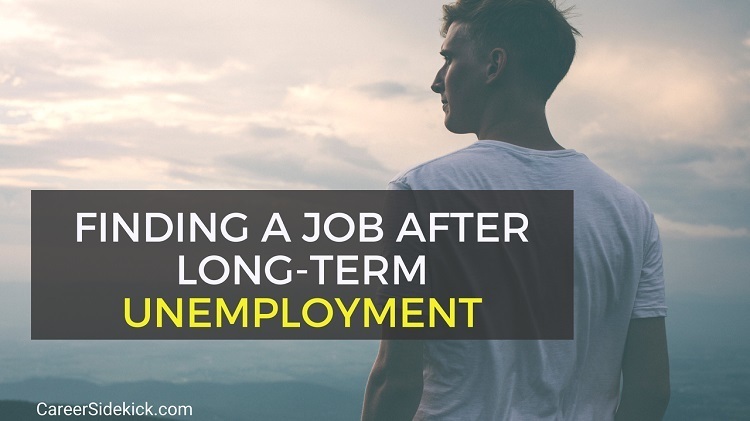 The post Finding a Job After Long-Term Unemployment appeared first on Career Sidekick.